SPListX introduces the document packaging feature in order to keep the related documents together and store it in a single compressed folder for easy access. In the present version, the packaging option is enabled for exporting document sets and document versions (version history) in a compressed folder, where the need to group relevant documents together is vital. Until the previous version, the standard Windows folder container was used to store all the documents in a document set together. But when doing so, user will have difficulties in differentiating between the standard / default folder that was created in a SharePoint library and the folder was created with a document set content type as they had an identical structure or look and feel. We understood that there is an alternate representation required to avoid the resemblance between a standard SharePoint folder and a document set folder when exported to the file system. We felt it is quite acceptable to export document set contents to a compressed zip file or compressed folder. Hence, the standard SharePoint folder is still exported as a file folder, whereas the document set is now exported as a compressed folder to create the distinction. Additionally, SPListX exports the document set version history information in a separate XML file in the same location as the metadata file. Until version v5.3, SPListX enabled users to export every document’s version to separate version folder or in the same folder location as the latest version with a certain unique name by tagging Version Number or GUID to the document name. 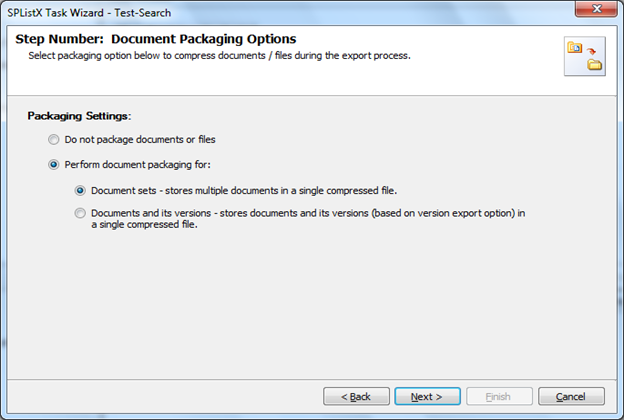 SPListX v5.4 introduces a document packaging feature, wherein the latest version and its history documents are stored in a compressed zip file / compressed folder. You will now find it is easy to search for a particular document version and maintain the exported contents together a single folder location.